So they were not at all accurate in stating they'd fulfilled their obligations under the CCA 1974? They should have sent notices under Sections 76 (1) and 98 (1) and given me more of an opportunity to come to an agreement with them? "The lender must have notified you of their intention to register a default against you at least 28 days before doing so, in order to give you time to make an acceptable payment or reach an agreement with them on an arrangement. " "If an arrangement is agreed (see Principle 3 above), a default would not normally be registered unless the terms of that arrangement are broken. " So as the bank had agreed to my repayments it should not have subsequently registered a default? I've noticed that there appears to be later versions of the CCA (2006?) Why is it that they don't appear to have replaced the 1974 version? CCA2006 was only amendments to CCA1974. Many thanks for your response. Really helpful. I'm not clear on the relationship between the CCA and the guidelines on filing defaults ("Principles for the Reporting of Arrears, Arrangements and Defaults at Credit Reference Agencies"). 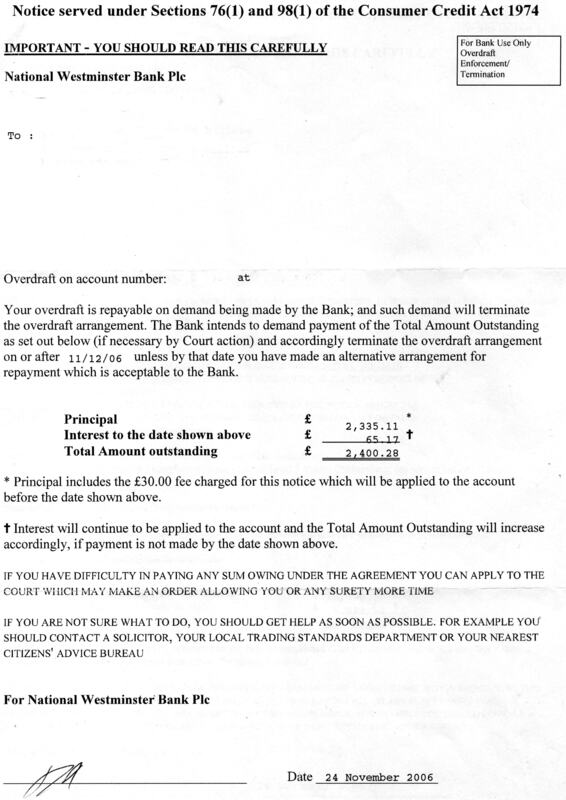 Do both apply in the case of registering a default against overdraft arrears? 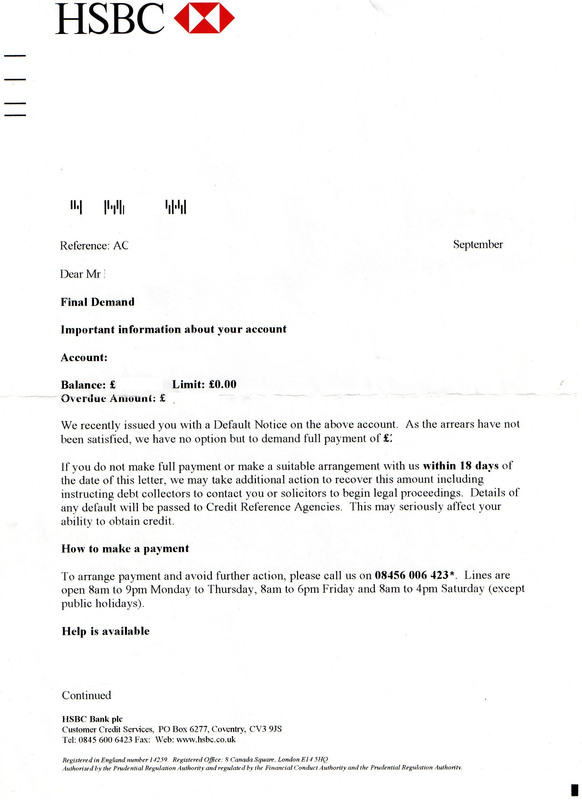 7.3.8 - An example of where a firm is likely to contravene Principle 6 and ■ CONC 7.3.4 R is where the firm does not allow for alternative, affordable payment amounts to repay the debt 7.3.8FCA due in full, where the customer is in default or arrears difficulties and the customer makes a reasonable proposal for repaying the debt or a debt counsellor or another person acting on the customer's behalf makes such a proposal. The following CCA legislation with regards to recalling an overdraft. I'm exploring other avenues to resolve this now including BCOBS for which there seems to be very little guidance available. Is this an effective route? I'm also aware of the following but not sure how they all fit together in the context of my situation. The guidelines on filing defaults ("Principles for the Reporting of Arrears, Arrangements and Defaults at Credit Reference Agencies"). Do both apply in the case of registering a default against overdraft arrears? 7.3.8 - An example of where a firm is likely to contravene Principle 6 and ■ CONC 7.3.4 R is where the firm does not allow for alternative, affordable payment amounts to repay the debt 7.3.8 FCA due in full, where the customer is in default or arrears difficulties and the customer makes a reasonable proposal for repaying the debt or a debt counsellor or another person acting on the customer's behalf makes such a proposal. Threads merged and moved back to HSBC Forum. Well all the above are applicable...but lets run this back you did actually default or failed to service the overdraft for whatever reason and therefore the creditor must register any default as per the ICO guidlines and Credit Agency reporting.If you had settled the amount in full in time before the expiry of the notice then you have case. If they did not serve the effective Default/Demand properly...you have a case. Making a lump sum and further payments.....was not clearing the default by the statuary time stated...no case. Asking them to not register a default and you will make various payments.......no case. Registering the default later than the actual default /demand time imposed...possibly a case...but you wont remove the default it would simply be adjusted by date. The Default Notice referred to was never sent (It has never been provided in any SAR response) - This was deeply confusing. I understand that a Notice served under Sections 76(1) and 98(1) of the CCA1974 must be issued, but is this one? Other examples I've seen clearly state what they are and include reference to Sections 76(1) and 98(1) of the CCA1974 in the header. The Final Demand letter provided 18 days of notice for full repayment or an arrangement. The 'Principles for the Reporting of Arrears, Arrangements and Defaults at Credit Reference Agencies' guidelines which I believe apply, and they are obliged to follow, state 28 days notice is required. The 'Help is available' section of the letter states they would try to work with me to come to an arrangement. They refused to. 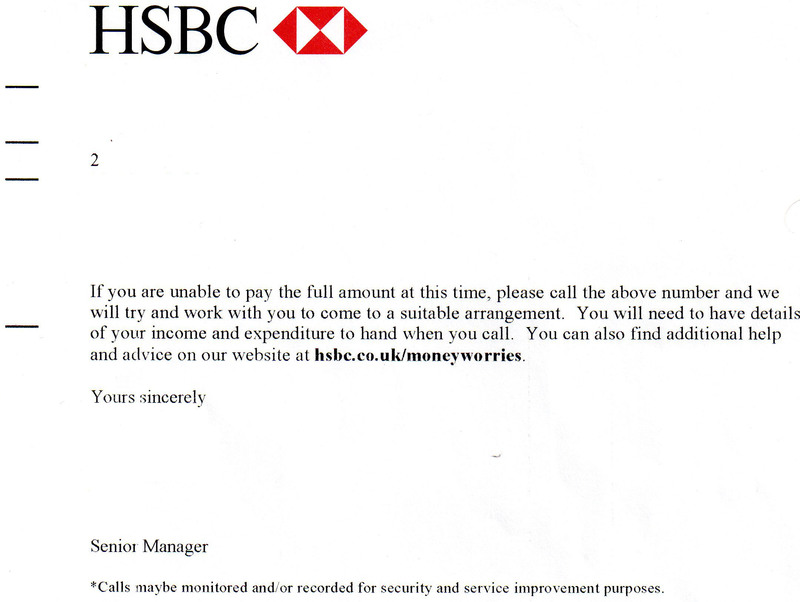 Subsequent correspondence on this point from HSBC stated only a full repayment would have been satisfactory. This completely contradicts what the Final Notice letter said and is the cause of the issuing of the default. Further thoughts on this greatly appreciated.